Featuring grade A, 100% pure nephrite jade jewelry, BillyTheTree announces they have reached nearly 250 different styles available now on their website. From jewelry to accessories, the beautiful ornamental stone is one of BillyTheTree’s hottest commodities. 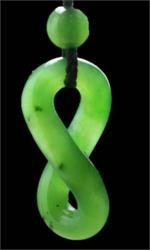 Jade jewelry at BillyTheTree takes many forms and shapes, such as this beautiful Maori style jade pendant. BillyTheTree is proud to announce they have reached nearly 250 different styles of grade A, 100% pure nephrite jade jewelry featured and available on their website, BillyTheTree.com. Revered by the Chinese for more than 5000 years, nephrite jade is prized for its special qualities, including extreme toughness, alluring translucency and smooth, polished feel. From beautiful jewelry to charming accessories, the beautiful ornamental stone ranging from pure white to all shades of green is one of BillyTheTree’s hottest commodities. In order to bring jewelry lovers the finest nephrite jade available, BillyTheTree’s supplier mines the jade themselves in Canada. Yearly, the supplier extracts approximately 100 tonnes of jade from two mines, and must be processed at the mine site within the constraints of a very short mining season. When mining jade, there are 4 distinct steps to the operation: exploration, breaking out, cutting and shipping. Water cooled diamond tipped core drills drill into the mountain side at which point the cores are then extracted to determine in the jade will meet the gem grade requirements suitable for the finished products and gem stones. Heavy hydraulic splitters will then force the jade apart, a far more difficult task than any other gem stone due to jade’s tough, tightly interlocked fibers. The jade boulders are then cut and loaded into trucks to be shipped to the nearest settlement where it will wait until the end of the season to be transported to the supplier’s warehouse. The jade jewelry collection on BillyTheTree.com features bracelets, brooches, charms, cuff links/tie clips, earrings, pendants/necklaces, rings and cabochons (beads). On sale now, jade jewelry lovers can save up to 40% on their purchase, and receive free worldwide shipping and 30 day satisfaction guaranteed.